Do Biofuel Mandates and Subsidies Imperil Food Security? Do biofuel mandates and subsidies inflate food prices? 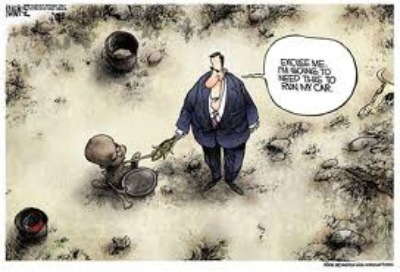 Do they increase world hunger ? There was a rip-roaring debate on the food security impacts of biofuel policies in 2007-2008, when sharp spikes in wheat, corn, and rice prices imperiled an estimated 100 million people in developing countries. Food price riots broke out in Bangladesh, Burkina Faso, Cameroon, Ivory Coast, Egypt, Indonesia, Mexico, Mozambique, Senegal, Somalia, and Yemen. Experts attributed the rapid rise in food prices to several factors including high petroleum prices, drought in Australia, a weak U.S. dollar, commodity speculation, and rising demand for grain-fed meat by China’s rapidly expanding middle class. But some also laid part of the blame on biofuel policies, which artificially increase global demand for corn and soy while diverting those crops and farmland from food to fuel production. A July 2008 World Bank report argued that biofuel policies accounted for as much as two-thirds of the 2007-2008 price spike. A July 2010 World Bank report, on the other hand, concluded that rising petroleum prices were the dominant factor. “Biofuels played some role too, but much less than previously thought,” the report stated. Where does the debate stand today? Recent reports by the National Research Council (NRC), the New England Complex Systems Institute (CSI), the UN Committee on World Food Security (CWFS), and Iowa State University (ISU) all acknowledge that biofuel policies put upward pressure on food and feed prices. The NRC and ISU studies argue that U.S. biofuel policies have only modest impacts on grain prices whereas the CSI and CWFS studies indicate that biofuel policies contributed significantly to the 2008 global food crisis and/or pose significant risks to global food security today. Links to these reports and key excerpts follow. Food-based biofuel is one of many factors that contributed to upward price pressure on agricultural commodities, food, and livestock feed since 2007; other factors affecting those prices included growing population overseas, crop failures in other countries, high oil prices, decline in the value of the U.S. dollar, and speculative activity in the marketplace. To date, the agricultural commodities most affected by U.S. biofuels production are corn and soybean. The increased competition for these commodities created by an expanding biofuels market has contributed to upward pressure on their prices, but the increase has had a small effect on consumers’ food retail prices, except livestock products, because corn and soybean typically undergo some processing before reaching consumers’ food basket. The difference between the price of an unprocessed commodity and the retail price of processed food is typically large. The committee estimated that an increase of 20-40 percent in agricultural commodity prices would result in an increase in the retail price of most processed grocery food products (for example, breakfast cereal and bread) containing those commodities of only 1 to 2 percent. We further systematically consider other proposed factors affecting food prices. We provide quantitative evidence excluding all of them from playing a major role in recent price changes except corn to ethanol conversion. We show that, aside from the high price peaks, the underlying trends of increasing food prices match the increases in the rate of ethanol conversion. Only a small fraction of the production of corn before 2000, corn ethanol consumed a remarkable 40% of US corn crops in 2011, promoted by US government subsidies based upon the objective of energy independence, and advocacy by industry groups. Corn serves a wide variety of purposes in the food supply system and therefore has impact across the food market. Corn prices also a ect the price of other crops due to substitutability at the consumer end and competition for land at the production end. Regulation of markets and government subsidies to promote corn to ethanol conversion have distorted the existing economic allocation by diverting food to energy use. This raised equilibrium prices, increased energy supply by a small fraction (US corn ethanol accounted for less than 1% of US energy consumption in 2009 and reduced grain for food by a much larger one (US corn used for ethanol production is 4.3% of the total world grain production, even after allowing for the feed byproduct. A parsimonious explanation that accounts for food price change dynamics over the past seven years can be based upon only two factors: speculation and corn to ethanol conversion. We can attribute the sharp peaks in 2007/2008 and 2010/2011 to speculation, and the underlying upward trend to biofuels. The impact of changes in all other factors is small enough to be neglected in comparison to these effects. Biofuel support policies in the United States and the European Union have created a demand shock that is widely considered to be one of the major causes of the international food price rise of 2007/08. By generating a new demand for food commodities that can outbid poor countries and food-insecure populations, industrial biofuels highlight the tension between a potentially unlimited demand (in this case for energy) and the constraints of a world with finite resources. Several proposals linked to changes in existing mandates could reduce the likelihood of biofuel production contributing to price spikes. Given the major roles played by biofuels in diverting food to energy use, the CFS should demand of governments the abolition of targets on biofuels and the removal of subsidies and tariffs on biofuel production and processing. It is indisputable that biofuels contribute to higher agricultural commodity prices because the biofuel industry represents a large and growing share of demand for maize, vegetable oil and sugarcane. But biofuel production levels are not driven solely by government subsidies. Biofuels are the only large-scale substitute for liquid transportation fuels, so when crude oil prices rise, so too does the demand for biofuels. Furthermore, high agricultural commodity prices are not caused solely by expanded biofuel demand.
. . . a large expansion in US ethanol production would have occurred even if the subsidies and mandates had not been in place. The reason is that the return on investment in ethanol would have been so high that investors still would have brought their capital to the industry. As shown, the model indicates that in 2009, ethanol production would have been about 1.2 billion gallons lower without subsidies. The largest difference in production would have been in the 2008 marketing year when subsidies increased ethanol production by more than 2.3 billion gallons. Market-based expansion of ethanol contributed about 50 percent to the difference in maize prices between 2004 and 2009. The direct conclusion of these results is that ethanol subsidies have had little impact on crop prices and that market-based expansion of ethanol had a large impact on maize prices, a modest impact on wheat prices and practically no impact on soybean and rice prices over this time period. Overall, these results indicate that the effects of both ethanol subsidies and market-driven expansion of ethanol on US food prices have been small. I may comment further on these reports in a future post. In the meantime, I will simply observe that if Babcock is correct, and U.S. biofuel policies have only a small influence on food prices because “a large expansion in US ethanol production would have occurred even if the subsidies and mandates had not been in place,” then U.S. taxpayers get little or no energy-security bang for billions of biofuel bucks. 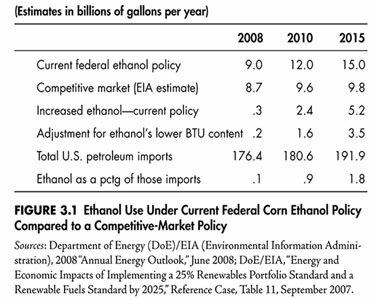 The costs of ethanol policies are enormous, estimated at more than $500 billion to American consumers and taxpayers from 2008 to 2017. The taxpayer costs include subsidies to corn growers and for ethanol production. 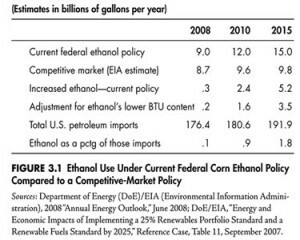 The EIA forecast shows that current federal ethanol policy produces a minuscule additional amount of ethanol over what would be produced using a competitive market policy in the foreseeable future. In 2010, a mere 600 million gallons of additional ethanol were produced, roughly 5 percent of the 13 billion total gallons produced. In 2015, federal policies will increase production by just 1.4 billion gallons. The latter is less than 1 percent of U.S. gasoline consumption, and the cost per barrel of petroleum import reduction is an astounding $2,171. Next post: Vaclav Klaus: Ignore Climate Change!